Tutorials six and seven introduced the translation transformation, also called the Newtonian equation. The Newtonian equation, which forms the foundation of classical mechanics is extremely useful and describes how objects move from one place to another. Answering questions about positions is extremely useful. 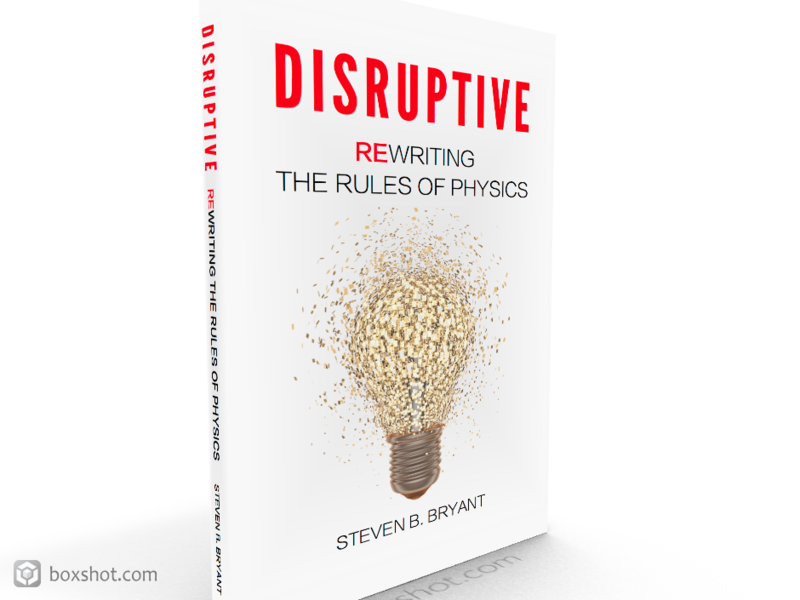 Modern Mechanics, a model we’ll introduce shortly as a superset of classical mechanics and a replacement for relativity, builds on the foundation of geometric transformations. In addition to answering questions about positions, it explicitly recognizes the importance of answering questions about distance – or how far something travels. Answering a question about a distance does not always require us to answer a question about a position. To illustrate how distances are used in Modern Mechanics, we’re going to introduce a woman to our previous examples involving the bus. The woman has one goal, which is to run on the street from the rear of the bus to its front. Upon reaching the vehicle’s front, she turns around and runs to the rear of the bus. 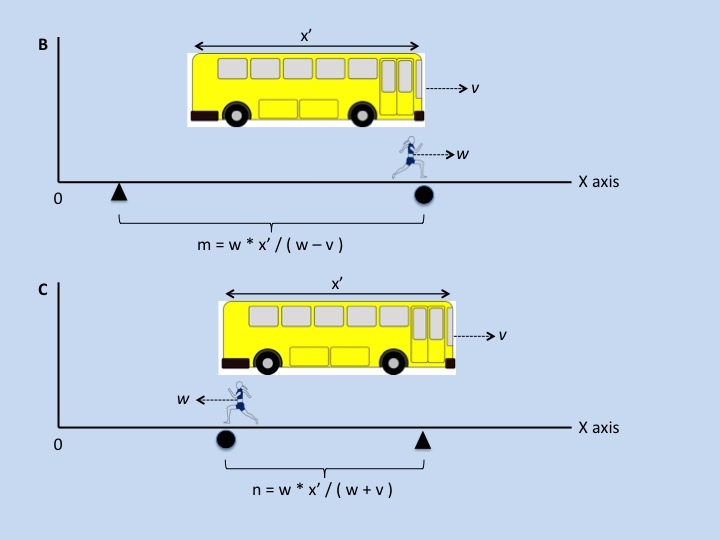 Let’s assume that the bus travels forward at a constant velocity v and the woman runs at a constant velocity w. In order for the woman to run back and forth, the bus must move at a slower velocity, v, than the woman can run, w. To do otherwise would mean that the bus would pull away and she would never reach the front of the bus. How far does the woman travel when she runs from the rear to the front of the bus? How far does the woman travel when she runs from the front to the rear of the bus? What is the average of the previous two answers? The bus is currently stationary and its length is x’. 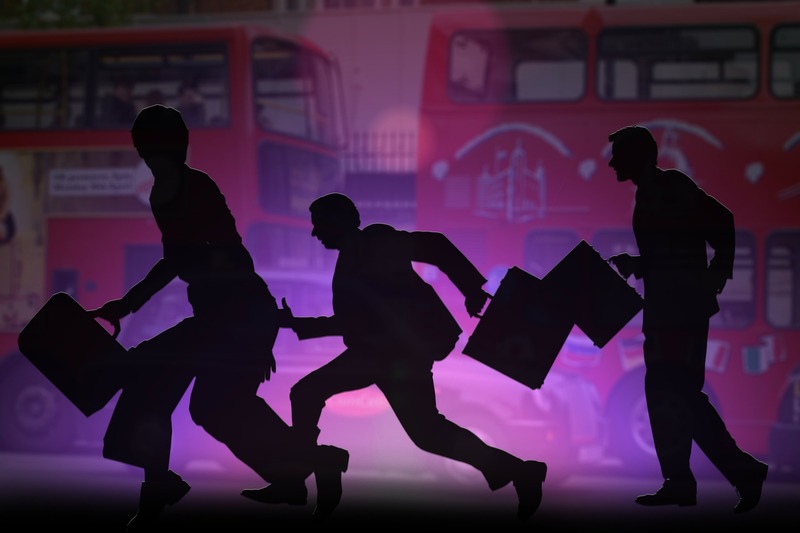 The woman runs from the rear of the bus to the front of the bus in time x’/w. When this time is multiplied by her velocity w, we know that the distance she run was l. The triangle represents her starting position and the circle represents her ending position. In this case, where the bus is stationary, the distance she travels, l, is the same as the length of the bus, x’. In Modern Mechanics, we called this length, x’, the segment length. Next, we put the bus in motion at velocity v, as illustrated in the following diagram. The first thing to notice is that the bus must move slower than the woman. Without this constraint, the woman would never reach the front of the bus. When moving from the rear of the bus to the front, as illustrated in B, the length that the woman travels, m, is greater than the length she travels when the bus is stationary, l. In Modern Mechanics, this length is called the forward intercept length. When moving from the front of the bus to the rear, as illustrated in C, the length the woman travels, n, is less than the length she travels when the bus is stationary, l. In Modern Mechanics, this length is called the reflected intercept length. These distances are scaling transformations. Here is an important characteristic about this average, a. Remember, it is the average of the forward intercept length and the reflected intercept length. If the velocity of the bus matches or exceeds that of the woman, then she will never reach the front of the vehicle and turn around. She will never be able to complete the forward intercept length. Like the forward intercept length, the average intercept length is constrained to cases where the velocity of the bus is less than that of the woman, or v < w.
Notice that we are able to answer distance questions without regard to the position. Specifically, while the length of the bus is x’, we did not discuss the exact position of the woman or the bus. This brings us to a very important point: We have to guard against confusing a distance for a position and vice versa. It might surprise you, but with this understanding of translation and scaling transformations, you now have learned many of the key elements that form the foundation of Modern Mechanics, classical mechanics, and relativity theory. Fact: Describing the motion of objects in terms of position and distance can be performed using only geometric transformations.